The Lamdré (Skt. mārgaphala; Tib. ལམ་འབྲས་, Wyl. lam ‘bras), 'Path with the Result' instructions, related to the deity Hevajra, are the highest teachings within the Sakya school. It consists of two parts: the first part called Triple Vision explains the Sutrayana path, the second part called Triple Tantra explains the Tantrayana part focusing on esoteric Hevajra teachings. the secret presentation known as Lamdré Lopshé (Explanation for Private Disciples). As H.H. Sakya Trizin explains: "The term lamdré means 'path and result'. This term indicates that this sacred system of teachings encapsulates the core Sakya philosophy and practices resulting in the realization of the indivisibility of samsara and nirvana." As H.H. Sakya Trizin explains: "In the early Sakya tradition, Lamdré was actually one teaching. Later, during the time of Müchen Könchok Gyaltsen, when he gave Lamdré teachings, he gave the most esoteric, essential, and important teachings to his innermost disciples in his private room, whereas for the assemblies he gave the common teachings. 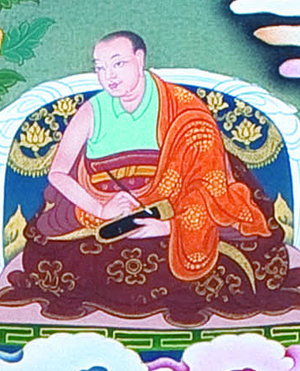 Since then there have been two Lamdré.” Tsarchen Losal Gyatso (1502–67) was an important master of the Sakya tradition, the founder of the Dar Drangmo Ché Monastery and the Tsar school of the Sakya order and holder of the Lamdré Lopshé transmission. A number of his writings survive, especially his compositions on the Hevajra visualization and on the Vajrayogini teachings. His biography was written by the Fifth Dalai Lama. His chief disciples were Mangtö Ludrup Gyatso, Yol Khenchen Zhönnu Lodrö, the Third Dalai Lama Sonam Gyatso, Zhalu Khenchen Khyentse Wangchuk, and Bokarwa Maitri Döndrup Gyaltsen. 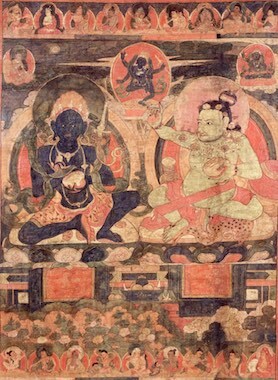 The root text of the Lamdré tradition is Virupa’s Vajra Verses. This page was last edited on 15 September 2018, at 23:52.